With Webster, the storage capacity of your FingerTec terminals is based on the capacity of your Webster server, leaving you with less worries about housekeeping. Webster acts as a platform that centralizes data from FingerTec terminals, making it easy for your to integrate any third party software at any point of time. With Webster, it is simple for the TCMS V2 or any other third party software to login and download attendance data for further processing. After the initial installation of Webster, management of Webster can be done simply via the web. Data from your FingerTec terminals are updated in a real-time manner to Webster, enabling you to view the latest updates. With Webster, you are able to centralize all your FingerTec terminal into a single server, making terminal management convenient. Put an end to unwanted delays. 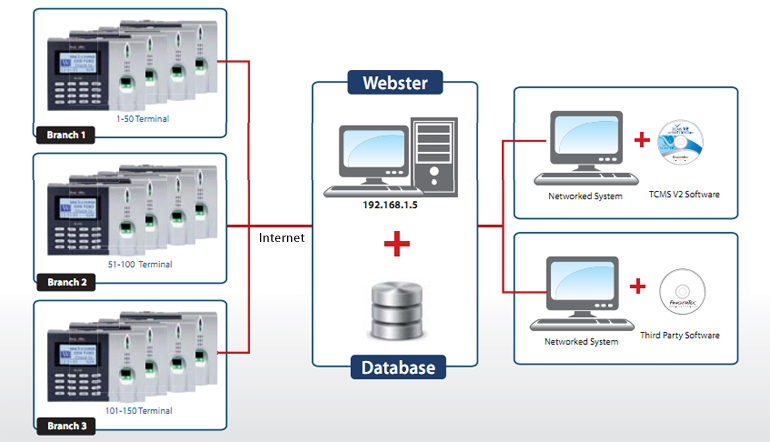 Webster ensures live data synchronization within and between branches, giving you the latest updated information everytime. Installing and setting up the Webster server is simple, as long as you have a Windows IIS-enabled computer handy. 1. Data is easily and remotely centralized in one single server. 2. Large data storage without having to worry about housekeeping. 3. Easily integrated with TCMS V2 or any other third party software. 4. Management of data is all done via the web. 5. Brance and HQ management easily done from any location. 7. Uses the Latest Microsoft Technology, Visual Studio .NET 2010 on .NET Framework 4.0. 8. Uses MySql Database: the world most popular open source, reliable & fast database. Note: Black & White screen models with "W" indicates that the terminal is Webster-enabled.